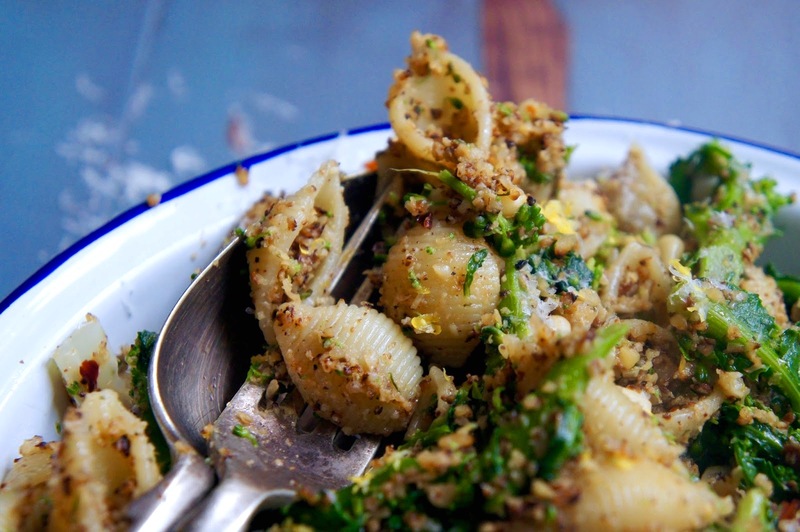 I’ve got into this habit of adding crispy sourdough crumbs to my pasta. Especially when mixed with spices such as chili and garlic, it adds a beautiful flavour as well as a magnificent crunch. I realise, however, that this is adding delicious carb to delicious carb and it would be in my waitsline’s favour to look at other options once in a while. Hence the cauliflower. Curious but slightly skeptical, I fried the cauliflower with some extra yummy bits (chili, pine nuts, lemon, thyme) until golden and went with it. I’m so happy to say that it was fantastic. 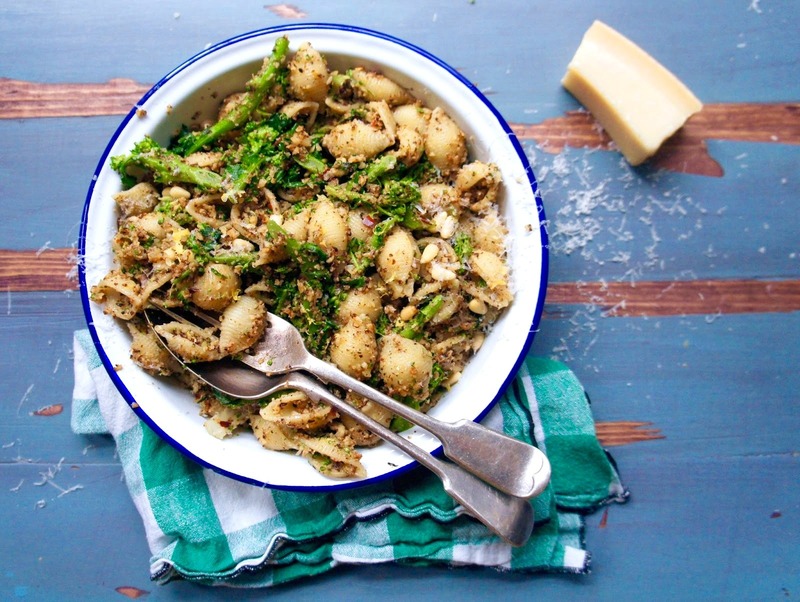 The cauliflower crumbs turn this dish from an already lovely pasta dish, into a veg heavy, spicy, textural wonderment. They don’t quite add a crisp, but they coat the pasta and create nuggets of deliciousness that hide themselves within the shells. 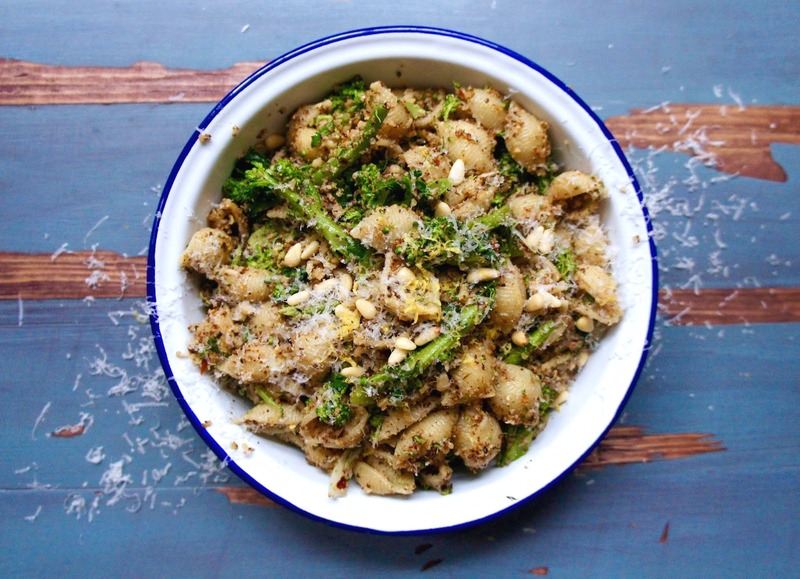 Add the purple sprouting broccoli to that and you’ve got a vegetarian, healthy pasta dish which tastes wonderful, not to mention the gazillions of health benefits you get from chucking some broccoli in! Read about all those beautiful broccoli benefits here; glowing skin? Yes please. It also passed the man test. 1. Roughly chop the cauliflower and add it to the food processor with the pine nuts. Process until finely chopped, like coarse bread crumbs. Don’t process too much. 2. Heat a couple of glugs of olive oil in a large, wide saucepan on a med-high heat. When hot, add the chopped garlic, cauliflower crumbs, lemon zest, 1 tbsp chili flakes, thyme leaves, large pinch of sea salt and a few twists of black pepper. Fry the cauliflower until golden, about 15 minutes. Leave the mixture long enough to catch on the bottom of the pan and go golden, don’t stir too regularly. 3. While the cauliflower cooks, cook your pasta in a large pan of salted water. When there are 5 minutes left until your pasta is ready, add the chopped broccoli to the pasta pan. Top up with more boiling water if needed. When ready, drain and toss with 1 tbsp olive oil. Set aside until the cauliflower crumbs are ready. 4. 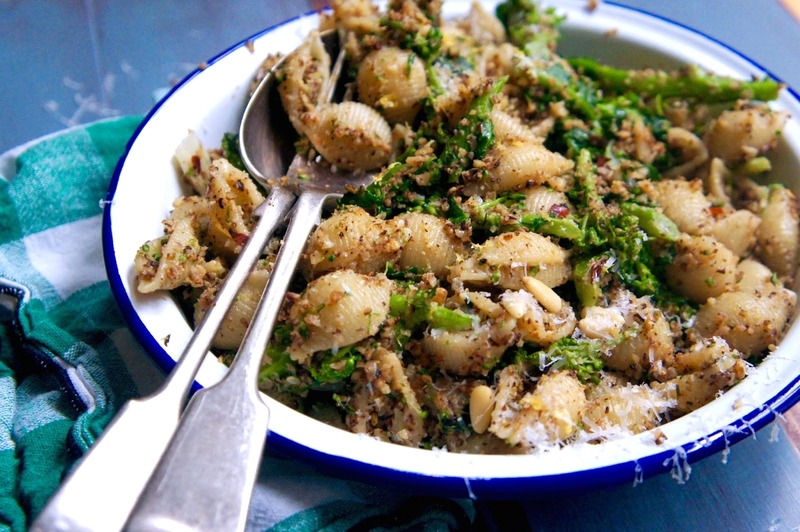 When the cauliflower crumbs are cooked through and golden brown, after about 15 minutes, add them to the pasta and broccoli in a large mixing bowl. Grate half the parmesan into the mixing bowl and stir in. Taste and season if necessary. Move to serving bowl and grate the remaining parmesan on top.